The process of preparing to relocate to the new Congregational Archives and Heritage Centre has afforded the staff of the Congregational Archives the opportunity to examine some of the lesser known items held in the collection. 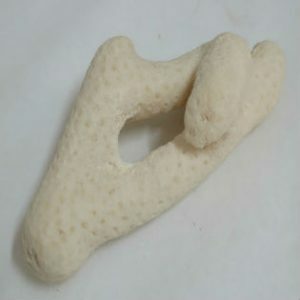 One such item, one of the more unusual objects which forms a part of the museum collection, is a piece of white coral. As is the case with most museum objects, the significance and value of the object lies in its history and provenance. This piece of coral was collected from the coral reef surrounding the shipwreck site of the Batavia, Australia’s second oldest known shipwreck and one of the most infamous and gruesome stories in global maritime history. 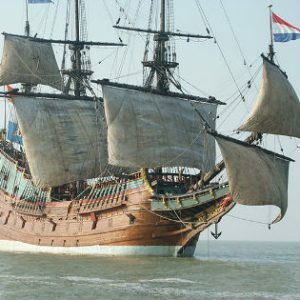 The Dutch ship Batavia foundered on the Morning coral reef in the Wallaby group of islands, a part of the larger Abrolhos group of islands which sit approximately 90 kilometres off the coast of Geraldton, Western Australia. The ship was wrecked in 1629; the drownings, abandonment, mutiny and murders which followed were some of the most violent events in maritime history, and are remembered as a harrowing experience for some of the earliest European visitors to what is now Australian territory. While today the shipwreck of the Batavia is a well-known and documented marine archaeological site, this was not always the case. The discovery of the site came more than 300 years after the ship sank in 1629. The eventual discovery of the site was the result of decades of tireless research by historians and authors, one of whom was Henrietta Drake-Brockman. Drake-Brockman was a Western Australian author, historian and playwright who researched the Batavia for many years prior to publishing a book Voyage to Disaster, a biography of the commander of the ship, Francisco Pelsaert, in 1963. Disputes had existed for some time in regards to the likely site of the shipwreck. Drake-Brockman undertook significant research on the event, including accessing Dutch archival material on the event and visiting and diving at possible wreck sites. Eight years prior to the discovery of the site in 1963, she had proposed a probable wreck site, which was eventually proven to be correct. And this is where we return to the piece of coral housed in the Congregational Archives. This coral was collected by Henrietta Drake-Brockman from the shipwreck site of the Batavia, presumably when she dived at the site following its discovery in 1963. According to notes accompanying the object, the coral was given to a woman identified only as Elizabeth H, who had assisted in editing the manuscript for Voyage to Disaster. 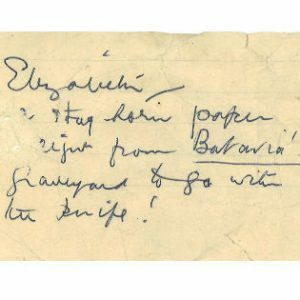 One of the notes makes reference to a knife, which was an earlier gift exchanged from a research trip to Indonesia. Elizabeth H later donated the coral to the Congregational Archives in the hope that it would have a permanent home in a historic collection. Upon assessing the object, Congregational Archives staff determined that the object would have a more suitable permanent home in a Western Australian collection. The Western Australian Museum, which includes the WA Maritime Museum, Shipwrecks Museum and Museum of Geraldton was contacted, and has gratefully accepted the donation of the object from the Sisters of Charity of Australia. The coral will now be donated to the WA Museum, where it will form a part of the collection as an object of significance not only to the infamous and historic story of the Batavia, but to the history of the Museum itself.